When I was growing up in the late 1930s and early 1940s, I recall one of my friends lived on a house boat docked in the Chicago River near Irving Park. Could you tell me more about the house boats? These days, houseboats are usually associated with coastal cities or river cities overseas, like Amsterdam, but people did indeed live in houseboats on the Chicago River’s North Branch in an area that some called Boatville. At the colony’s peak during the Great Depression, more than a hundred houseboats, many converted scows, lined the banks of the river from about Montrose Avenue down to about Addison Street, right by the old Riverview Park. It was cheap! Houseboat living was a way to avoid things like real estate taxes and high rents, not to mention that housing was scarce. One newspaper article said that residents paid an average of a dollar a month to moor their houseboats, which had many of the comforts of houses on land. Some boats were wired for electricity and were hooked up to city plumbing; others used generators. Many heated their floating homes with oil stoves during the winter. There was even a houseboat bar for a time (the feds raided that one though). The question of the houseboats’ legality was about as murky as the river water. When the squatters’ camp started growing during the ‘20s, the city’s Sanitary District tried to evict the occupants, citing water pollution and navigation concerns. 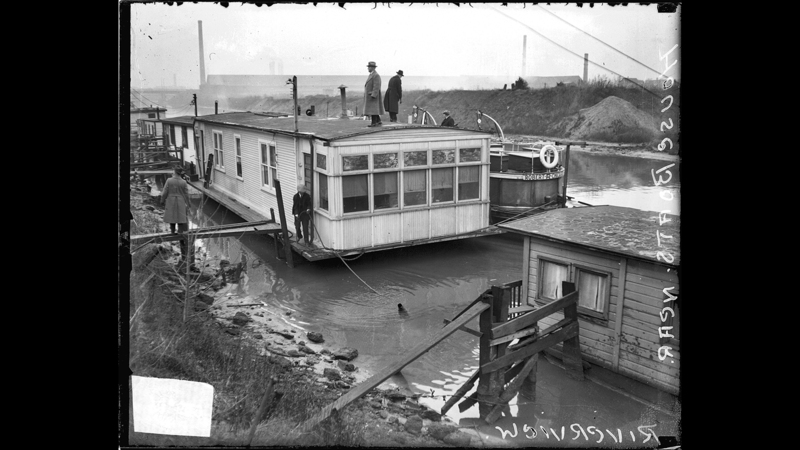 When a judge issued an injunction preventing the houseboats from being ousted in 1930, the colony grew. Even today, according to the Metropolitan Water Reclamation District, houseboats are not strictly illegal—but they are heavily regulated. Boatville was mostly an adult community—many of the residents were retired boatmen, ex-sailors, and streetcar motormen—but a 1948 Tribune article about the colony featured the Sonday family, who lived on the North Branch with their infant son Claude. We were able to get in touch with Claude, though he doesn’t remember too much about it since he was just a baby. He does remember playing on the riverbank near an abandoned car their house was tied to as a moor. Claude says his parents decided to move to land in 1949 when their home nearly tipped over in receding water—and the Sondays were already among the last of the Boatville residents. By the 1950s, most of the houseboats had vanished from the North Branch. Those that were left by the 1970s were confronted with increased pollution and permitting regulations. Even so, there were a couple of holdouts on the North Branch as recently as the 1990s. I was told that during the WWII years, Navy PT boats were built in a factory alongside the Chicago River at Belmont Avenue. Any truth to this? Grebe started his company building luxury watercraft in Milwaukee a few years before moving the operation to Chicago in 1926. When the United States entered World War II, Grebe joined the war effort, producing more than 50 Navy craft as we mentioned earlier. According to the Maritime Museum, the shipyard’s existence was a big reason that moveable bridges were kept in place on the North Branch: the bridges needed to open to let the Grebe-built craft through. After the war was over, Grebe returned his business to mostly building pleasure craft for such Chicago luminaries as Philip Wrigley and Sterling Morton of Morton Salt. When Grebe passed away in 1952, his widow Marguerite took over operations, which was unusual enough at the time to merit a couple of newspaper articles about her. She helmed the company until they built their last boat in 1972. The company continued to operate at the site until 1994 for boat storage and maintenance. Today the site is a townhome development. We’ve actually used two vintage Grebe boats in our river tours. We used a 1936 sedan cruiser, the Robert Allen II, in the 2005 river tour, and this year in our upcoming river tour we traveled the North Branch in the Lady Grebe, a 48-foot mahogany yacht built in 1961. Note: This edition of Ask Geoffrey originally aired on "Chicago Tonight" on Nov. 8, 2017.